Showa Memorial Park (国営昭和記念公園) is one of the largest park in Tokyo. It has a great forest with many beautiful nature, pond and open field. It has many flowers, such as Sakura and Autumn leaves. Admission: 410 yen for adult. 80 yen for under Junior. 210 yen for senior. 1. use JR Chuo Line to Tachikawa Station. Showa Kinen Park was built in 1983 for the 50 years of anniversary of Emperor Showa Enthronement. 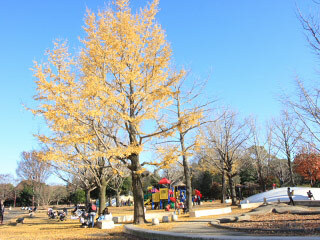 It is one of the largest park in Tokyo. There are a lots of facilities for sports and family activities. It has also large nature with many seasonable flowers. Sakura in Spring, Hydrangea in Summer, Ginkgo in Autumn, and Illumination in winter. There are boat riding, rental bicycle and swiming pool. Camellia, Narcissus, Sakura, Cosmos, Sakura and Autumn Leaves.